Please join GreenLion Studios for the exhibition reception of "BUNNICULLA - works by Deerjerk and Eric Carlson" on Saturday, November 18th from 7-10pm. The exhibition will be on view from Saturday, November 18th through Wednesday, December 20th. To experience our gallery after the reception, please email contact@greenlionstudios.com or call (616) 805-5788 to make an appointment for Monday's, Tuesday's, Wednesday's, and Saturday's. Please join GreenLion Studios for the the solo show opening reception of "Rising Sun: Works by Sarah Knill" on Saturday, August 19th from 7-10pm. Knill's paintings visually explores the connection of energy between the source of the Sun and the Self, the energy centers within, and the variation of frequency present in our universe. The exhibition will be on view from Saturday, August 19th through Wednesday, November 1st. To experience our gallery after the reception, please email contact@greenlionstudios.com or call (616) 805-5788 to make an appointment for Monday's, Tuesday's, Wednesday's, and Saturday's. Join us in our gallery from 7-10pm on Saturday June 17th for the solo exhibition reception of BJ ‘SOBAONE’ Johnson’s new tattoo illustration work! 20 designs featuring BJ’s flora and fauna aesthetic will grace the wall of our gallery for this special event show featuring the collection of original 5 x 7 in. illustrations created to be tattooed. The framed works of art will be available to claim for a tattoo. A $50 deposit during the exhibition will secure your piece while the remaining balance is to be paid on the date of the tattoo appointment. Prices of each piece will be advertised. After the tattoo appointment is completed at a later date the client will take home the framed work as well! Refreshments and good company will be provided! The exhibition will run from Saturday June 17th until Saturday August 5th, 2017. To experience our gallery after the reception, please email contact@greenlionstudios.com or call (616) 805-5788 to make an appointment for Monday's, Tuesday's, Wednesday's, and Saturday's. One night only! 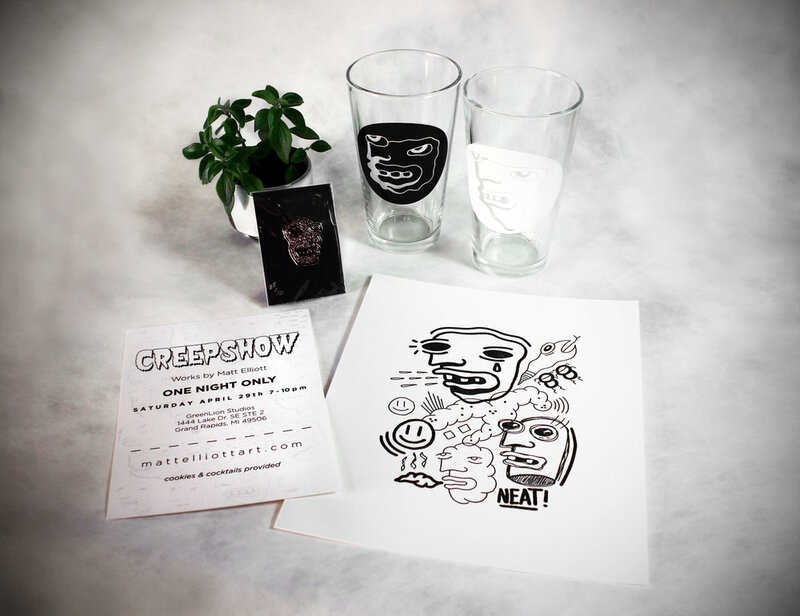 Join us for the fundraiser reception of "Creepshow", a solo show featuring the work of Matt Elliott, on Saturday, April 29th from 7-10pm. The fundraiser intends to offset the costs of treatment for Matt's diagnosis of Lymphoma. Stickers, Shirts, Patches, Pins, Panels, Prints, and more will be for sale featuring the very #creepy work of #mattelliottart, as well as the opportunity to get a creep tattoo DURING the reception from pre-designed flash drawn by Matt Elliott himself, and tattooed by BJ 'SOBAONE' Johnson! (only $100 dollars for a creep tattoo you say?!) See you soon! Cookies & cocktails will be provided! To experience our gallery after the reception, please email contact@greenlionstudios.com or call (616) 805-5788 to make an appointment for Monday's, Tuesday's, Wednesday's, and Saturday's. Brooding melodies, synthesized rhythm, and introspective lyrics of the 80's and 90's are just a few of the many staples which define the Dark Wave musical genre. The artists represented in this exhibition seek inspiration from and reflect upon the musical talents of this era such as The Cure, Depeche Mode, Siouxsie and The Banshees, Joy Division, etc. Please join us for the opening reception of "Dis-Integrating: a Tribute to Dark Wave" on Saturday, February 11th from 7-11pm. Refreshments and good company will be provided! GreenLion Studios will be closed for the Holiday's from December 22nd, 2016 to January 1st, 2017. We'll resume normal business hours starting January 2nd, 2017. Happy Holidays! Due to our holiday schedule, GreenLion Studios will be closed from Saturday December 3rd until Sunday December 11th. In 2011, D-Bags & Dimwits was the first show hosted in the old GreenLion Studios space… It was so good, we’re doing it again! This exhibition features work inspired by classic cartoon archetypes of the D-Bag and Dimwit character duo! Please join us for our inaugural gallery reception and grand opening in the new GreenLion Studios space. Refreshments and good company will be provided! This exhibition will be on view from November 12th-December 21st, normal business hours. Join us in celebrating the Grand Opening of GreenLion Studios, BJ Johnson's private tattoo shop and art gallery. Concurrently, the reception of the D-Bags & Dimwits II exhibition will be taking place in our gallery. Refreshments and good company will be provided. OPEN CALL FOR ARTISTS - "Dis-Integrating: a Tribute to Dark Wave"
Do you love the Dark Wave musical genre? Bands like The Cure? Joy Division? You should apply for this show then!